Last year Mattel completely re-invented the View-Master by turning it into what eventually became one of the better Google Cardboard solutions on the market. For $30 it was cheap, comfortable, and held almost any smartphone available. And this year Mattel will be introducing a new model that fixes all the original’s minor problems. For instance, in order to accommodate smaller phones like the iPhone 5, a plastic adapter was included that was easy to misplace. 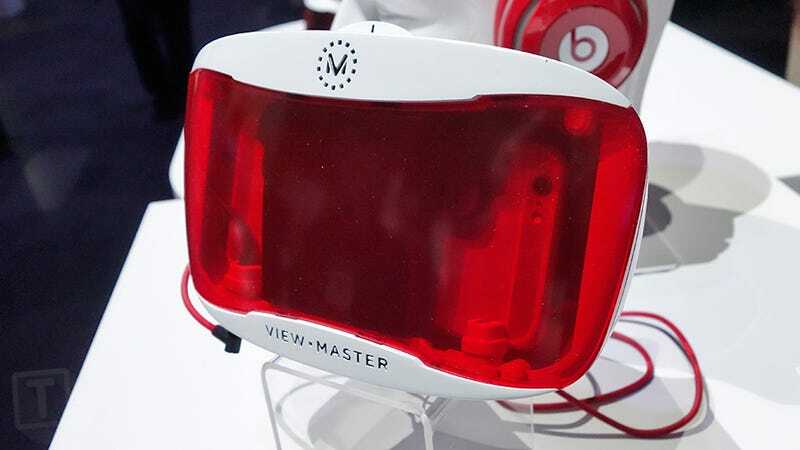 So for the View-Master Virtual Reality Viewer 2.0, Mattel has improved the design of the smartphone mount inside to accommodate a wider range of device sizes. The design of the original View-Master Virtual Reality Viewer also restricted access to a smartphone’s headphone jack, meaning you had to rely on speakers that were blocked and muffled by the housing. So the 2.0 model includes a headphone jack adapter that accommodates phones with the jack on the top or bottom. The View-Master Virtual Reality Viewer 2.0, available this fall, does see a price bump to $40. But it also now incorporates a focus wheel allowing the lenses to be adjusted for sharper results. And the viewer’s latch has been completely redesigned, since the original had the tendency to pop open at the worst time which increased the risk of a smartphone falling out to its demise. No virtual reality experience is worth that.